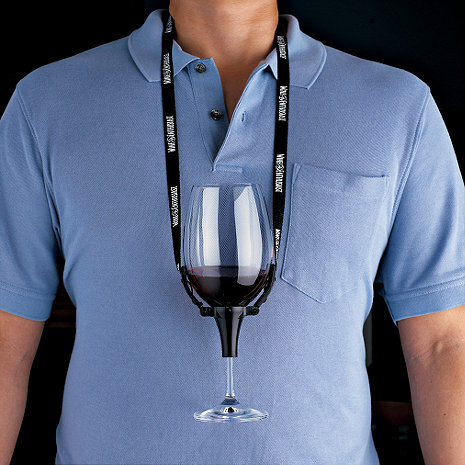 Keep your hands free at parties by keeping your wine close at heart! This clever little clip with adjustable strap holds a regular-size stemmed glass to your chest, giving you the freedom to snack and socialize as you sip! Keep your hands free at parties by keeping your wine close at heart! This clever little clip with adjustable strap holds a regular-size stemmed glass to your chest, giving you the freedom to snack and socialize as you sip! Available in Black or Purple. The plastic hinge has a tendency of opening and disconnecting from the glass holder portion of the necklace. I noticed the hinge each time before it was a problem, but if you are not expecting the necklace to open, you could spill your wine. Great for special wine tasting events! We used ours at the Party for the Senses at EPCOT's Food and Wine Festival. It came in handy--as we didn't have to balance our wines while trying to taste the many glorious foods by renowned chefs they offered in the huge room. this is a must if you frequently go to standing parties, bbq-s and wine tasting events.. I added personalized wine glasses to this set and presented to a good friend wine-lover.. he is now a super star at all those tasting events.. Depending on your height, however, make sure you train yourself of wear it as it is not necessarily spillproof (even with a big glass and a small amount of wine). Look for better competing product. Saw it at a wine crush for about 15 wineries and loved it. Perfect gift for a holiday exchange party - it was the hit of the party! Also experienced great customer service. I definitely will be a return customer. We used this for Party for the Senses, a food and wine extravaganza at EPCOT. A wonderful event but your hands have to balance the gourmet food items and it would have been difficult to also have to hold the wine glass. We received many positive comments and many people asked where they could be bought. I bought several of these for friends. Needless to say, they caused much merriment. They are just plain fun. I also gave my friends polycarbonate glasses to go with the "leashes" as it takes awhile to get used to and not spill wine or hit things. The fun factor alone is worth the expense. Have never failed to get a joyous reaction when wearing my wine holder... especially when visiting tastings at wineries. Everybody else wishes they had one. Was a hit. Gave as a gift to my brother in law he loved it. He saw one years ago and now has his own. THe best gift for a 50th birthday. We gave these to some of our wine loving friends and they were crazy about them. One even showed up at a New Year's party wearing it and using it! It was a great conversation starter between strangers. This holder is quite useful at receptions and buffets, etc. where you are standing and would otherwise need 2 hands to hold your plate and your glass, leaving you nothing to eat with.Some reviewers have objected to the dorky factor. I'd take convenience over coolness any day.I'd like the strap to be longer and the price to be lower($5.00 at the most). I think the length could be longer, but overall this will be an asset to those attending the Toast of the Town wine tasting event. It will make it easier to navigate the crowd and sample all of the food without spilling a drop of wine. Someone stopped us about every ten feet when we attended the Weston (FL) Wine & Food Festival. They all wanted to know where we got out wine glass holders. On the Wine Enthusiast website I told them. We attended this same event last year and saw a couple with them, so this year we came prepared. Great item to hold your glass when you are eating or filling out a wine order form. I used this at the Toast of the Town wine tasting in Chicago. It was great especially given the amount of food served by local restaurants. I found very practical use for it. However, it can be a bit awkward when trying to navigate through a crowd because of the fear of someone bumping against you and causing the wine to spill on your clothes. But it's manageable. Oh, and nice price... 2 for[$]Not bad! This will be used at the wine special event. IT WORKS - surprised !!!!! This works great when at an out door buffet and needing your hands to serve-up food etc. It is also great when entertaining on the boat while docked. There have been numerous times when guests have spilled glasses of red wine on the white cushions. I had bought this to use at a Wine Festival, however the stems of the glasses were shorter than the stem holder. Great idea, but didn't work for what I needed it for. this is a good idea, but I felt ripped off when it arrived. [$] for two shoelaces and a bit of plastic is way too much. $5 would be more like it value-wise.